Wow, what an unexpected treat. The river was so good, it almost made up for having most of my kayaking gear stolen from my car that was parked in front of my house the week before. Although that day of vacation from work didn’t work out, the following week Darin and I gave it another go. As the week progressed, the rain reports got better and better to where I know that I would need to take Wednesday off of work to take advantage of the rain. As Tuesday night came I began to realize that there was too much rain and instead of having our pick of a river to do we would be limited to what could take the most water. Perusing the book I remember the somewhat obscure Putah Creek which had been on my list for 4 or 5 years now. 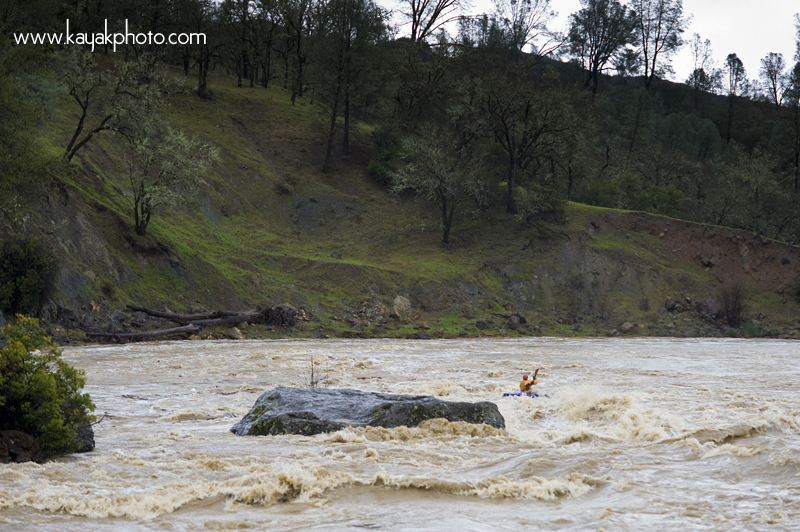 The description sounds promising, Lars ran it at 10,000 cfs and stated it had awesome rapids. 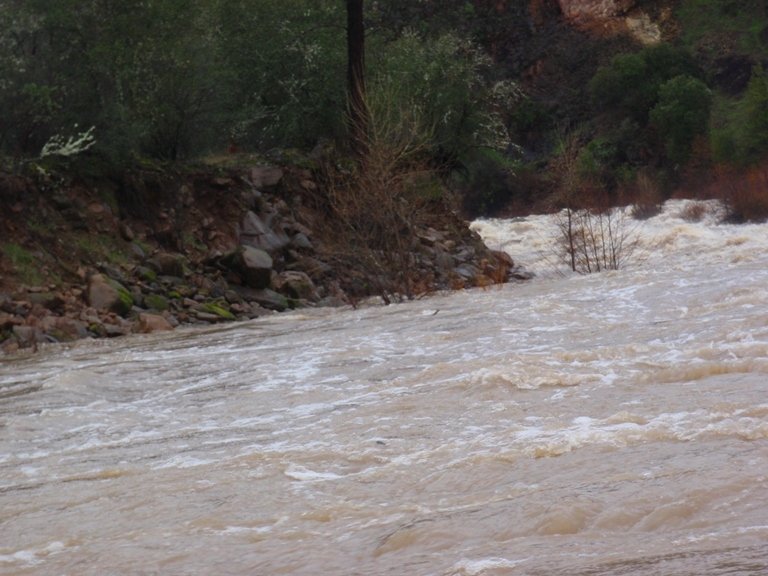 Tuesday the “creek” swelled to 6,000 cfs and the storm was supposed to get worse by Wednesday… sounds promising. The idea that this is a creek is a bit weird to me. Other than the Colorado through the Grand Canyon , this “creek” was the highest volume run I have done. When we pulled up to the take-out and I looked at the river, I thought I was looking at a lake paddle to take-out due to the massive width of the creek. 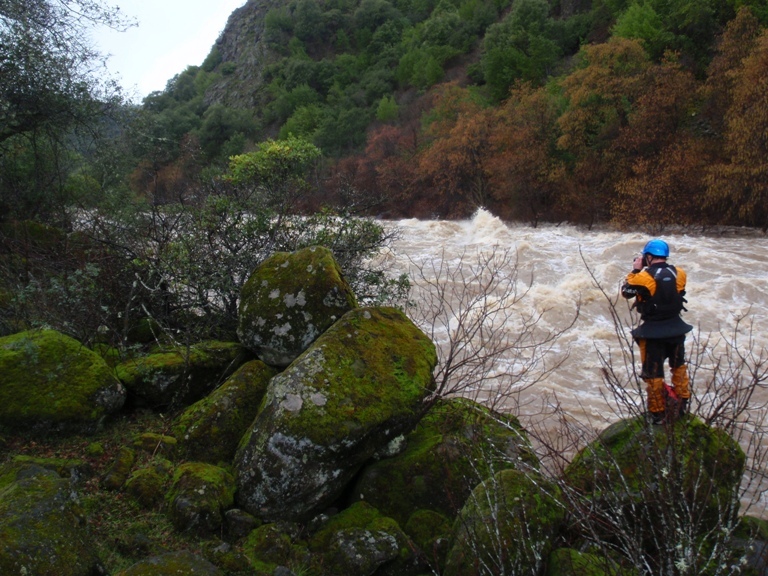 The thought was partially due to our knowledge that we had 2,000 cfs or so when we left the Sacramento area in the morning. 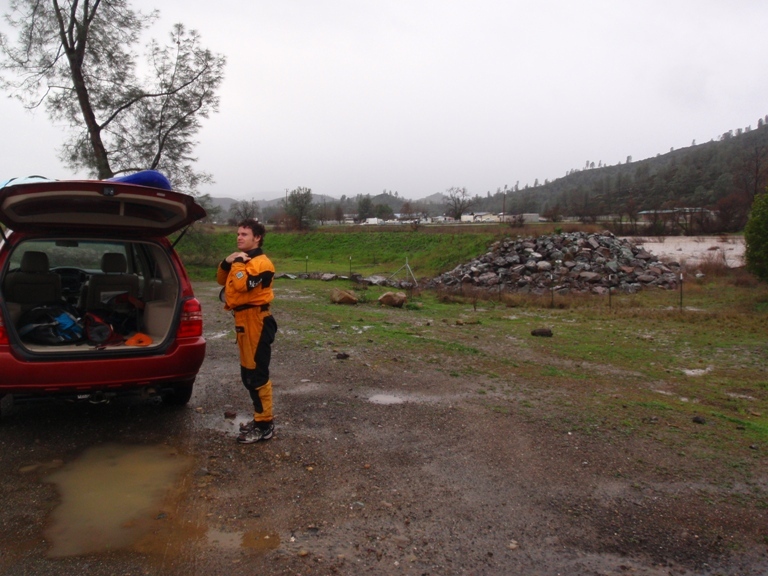 As we arrive at put-in we get service again and check the flows, now it is 4,500 cfs and going up… and even that report is an hour delayed in addition to being 4 miles downriver from the put-in. All we know is the river looks big and that there were rivers running down the shuttle roads. Stanley/Holbek say that the run has some awesome rapids at high water that verge on class V. As Darin and I push through the first 4 miles of flat water that were easy and fast due to the volume of water we begin to wonder when in their career they boated the run and trying to deduce if the difficulty may be inflated due to skill level at the time of the run. As we approach the rock wall that marks the beginning of the first gorge, we begin running bouncy class IV- read and run rapids. At the end of the first third of a mile we catch one of the first eddies we saw. We look downriver and state “it looks like it just continues being read and run” and peal back out into the current, ferrying over to the river left to the bigger channel. As we see around the corner, Darin suddenly glances back with his eyes big, a moment later I see what caused the reaction. Downstream and now inevitable, was a wave train that led to the largest exploding wave I have seen. To make matters worse, the wave had the appearance that it hid the largest hole the world has ever seen. 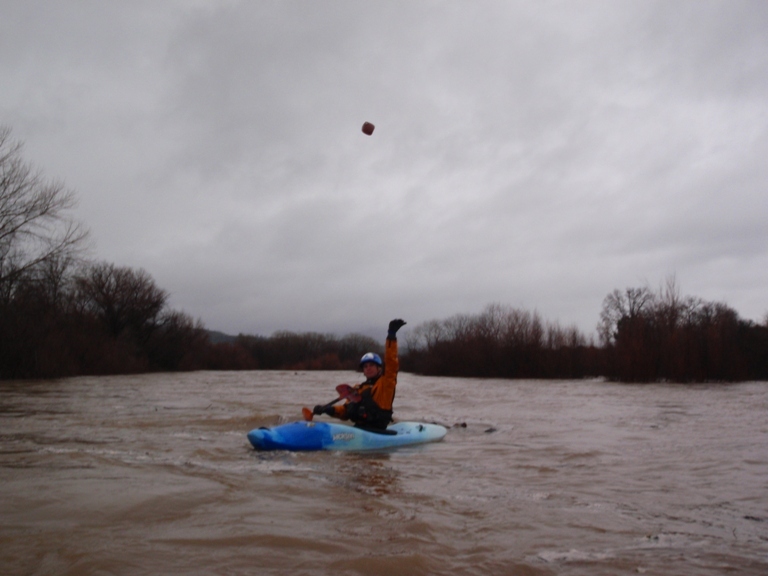 As we fly downriver we work as hard right as we can, hitting the huge lateral that fed us both into the edge of the wave. The thing had to be 15-20 feet tall and crashing. Behind it, to our surprise and pleasure there was no hole. Instead three or four more 10-15 foot tall waves crashed down, raining smiles and hoots upon us. As we catch a small eddy just below (by that I mean 200 yards) we are all smiles and have to get out of our boats to take a picture of the rapid. 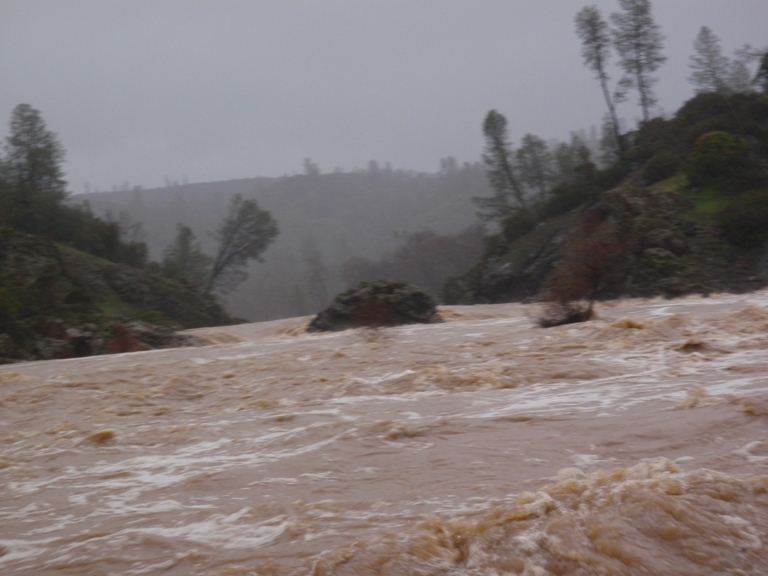 As we glance downstream prepared to shove off again, we look at each other and again say “seems like that was the worst of it, it looks to continue just read and run from here.” 20 feet later it was on again, dropping over huge waves down the right of the next rapid. In fear we again coward away from the meat of the rapid, but in hindsight it again turned out to be merely huge crashing waves, next time the meat will be had! 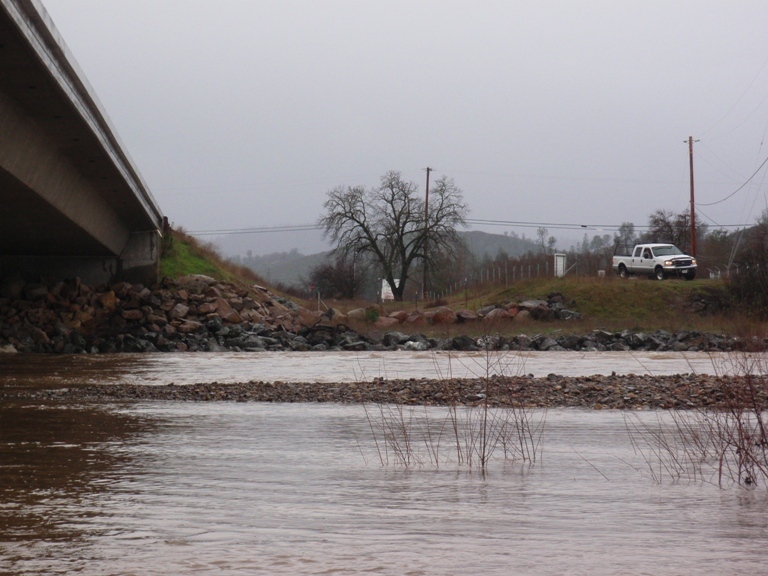 In the end, the rapid that was the first gorge was over a mile long. Although the skill required was only class IV+, a swim would be very bad with loss of gear would be the least of your worries. 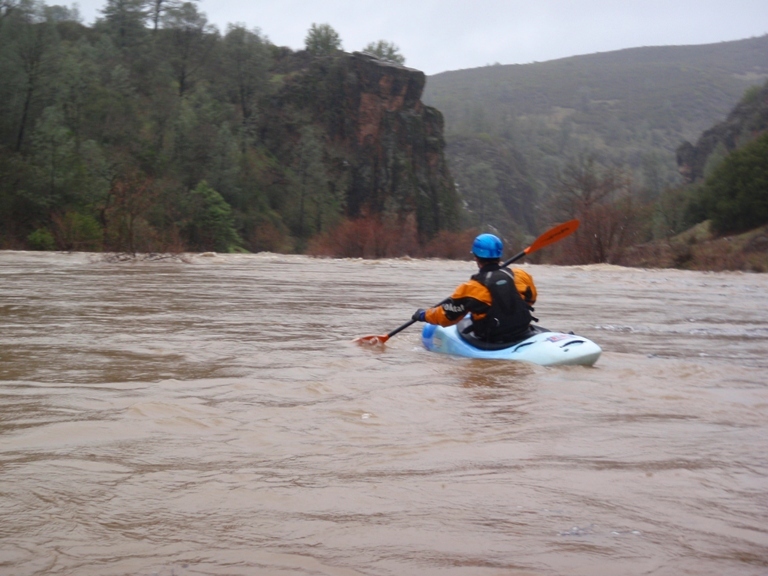 After the first gorge, the miles flew by, amazing waves were surfed, small tributaries added 1,000 to 2,000 cfs at a time and we soon approach another horizon line. This rapid was a huge rapid leading to several huge holes, luckily the ramp was wide enough we could avid the holes on either side. As we floated on we wondered if that was the second gorge, the river became flatter and wider and we agreed it had to have been. Then, we come to another horizon line. For once we got out to scout only to find the least consequential of the class IV stuff. 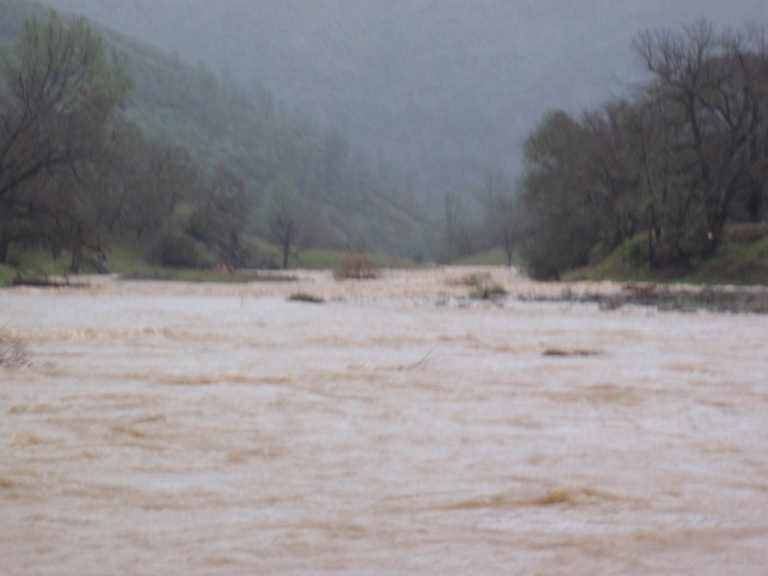 Now we were sure we were finished with the hard stuff, again the river widened along with the valley. So if you haven’t noticed Darin and I were wrong more often than we were right this day. And sure enough, not much time had passed before we were going over some more nice fun bouncy continuous read and run whitewater. 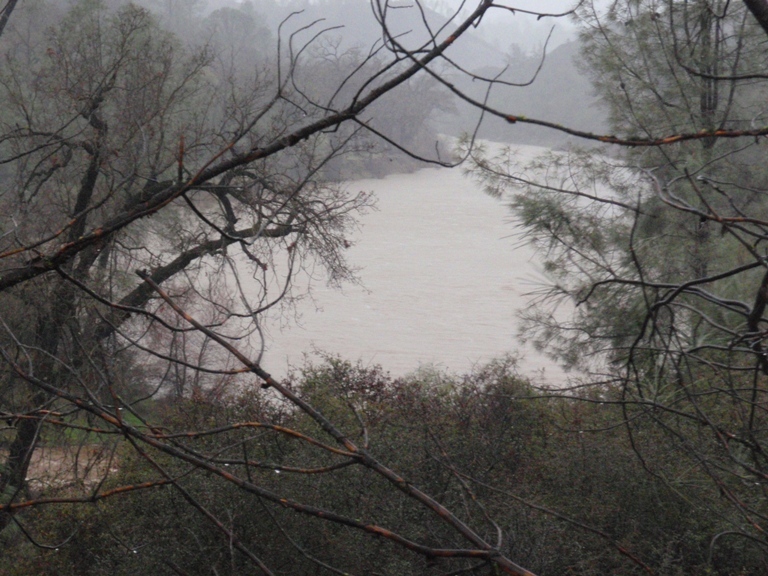 However, as the river bent right, all hell broke loose as the river dropped and dropped. 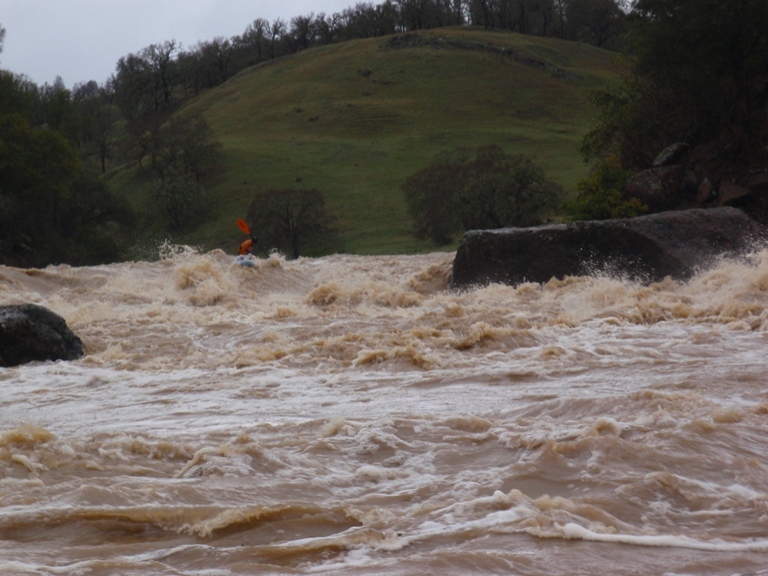 Unlike the previous large rapids, we could not see the bottom from the top, all we knew was it kept going, at least 1/3rd of a mile all in huge fashion. Darin enters down the right, and like a baby monkey holding on to his momma, I follow right behind. Thankfully Darin had just come back form a month in India where he was able to hone his big water read-and-run skills as this rapid had huge holes everywhere. 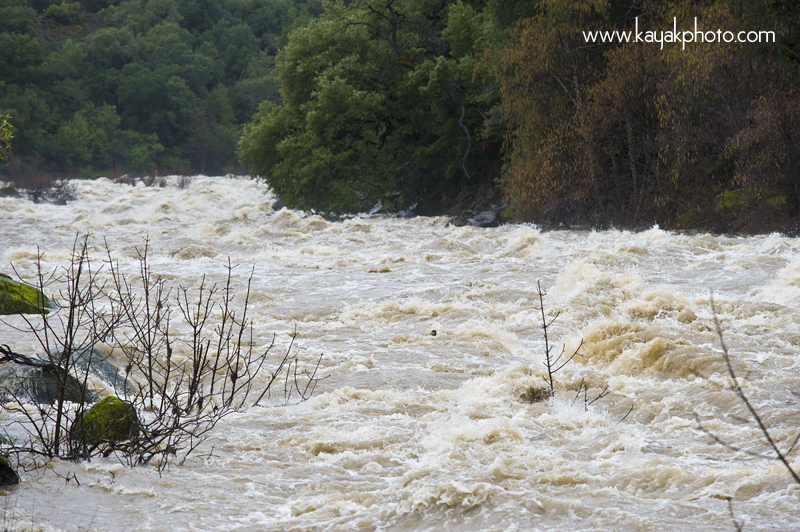 Unlike the other rapids, this rapid had consequence. Our line required us to be a foot off a huge pour over to the right which then fed us into a lateral which if not punch would feed you directly into a 30 foot wide hole. Down the middle were more holes and pour overs, however lucky for us, our right side was relatively clean once through that lateral. Half way down the river divided around an island and allowed us to eddy out to catch our breaths. The next 1/3rd of a mile was easy enough bouncy fun until again the river turn right and dropped down against a wall. A few holes and brief battle to stay off the wall later, we had finished another mile long Putah Creek classic. A few minutes later we round the corner and see take-out. Finishing one of the more surprisingly good days of boating I have had. So much for trying to talk Darin into joining me without over selling it since I fully expected the river to be a “worth doing once” type of creek. This river was a big water experience unlike anything else that I have done in California and will be visited again the next time the rain gods let loose on us. An interesting thing happened when I measured the run. I get 17.6 miles while every other reference has 16 miles. I trust me more and think everyone else just followed Schwind’s write-up from 1974. For a great low water write-up with pictures see Cacreeks. It is interesting to see how many large boulders were underwater. Be aware, at these flows scouting most rapids was not an option unless you wanted to take a one mile walk to get it all from the top. 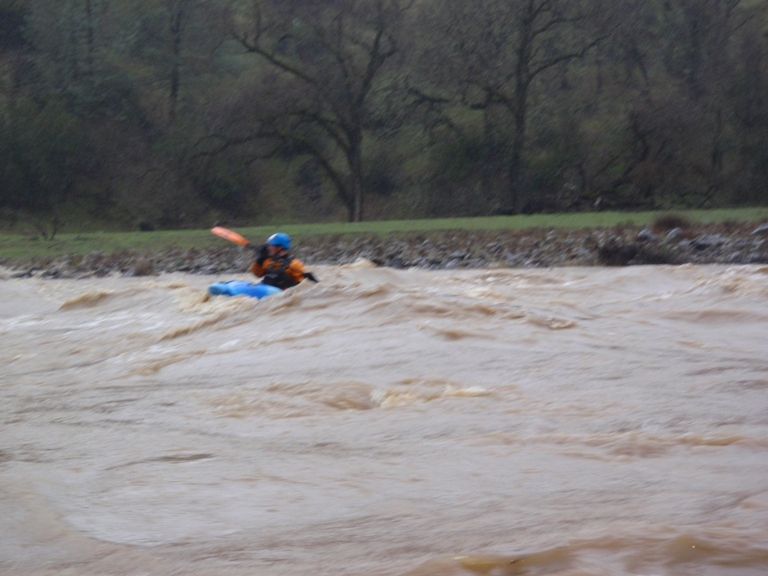 Once in the rapids eddies were small if present at all. The two gorges were so continuous that although I give each rapid less than a class V rating I would agree with Lars that each gorge felt like it was borderline class V when taking in context of the other rapids. More than any other river I have been on (of course I have basically no big water experience) this creek has a serious consequence of flush drowning. You could bet money on swimming each gorge in its entirety if you were to swim. So take as many rolls as you need. Thanks to Darin McQuoid for his contribution of photos. Due to the lack of stopping, we didnt get many, oh well. Mostly flat water. 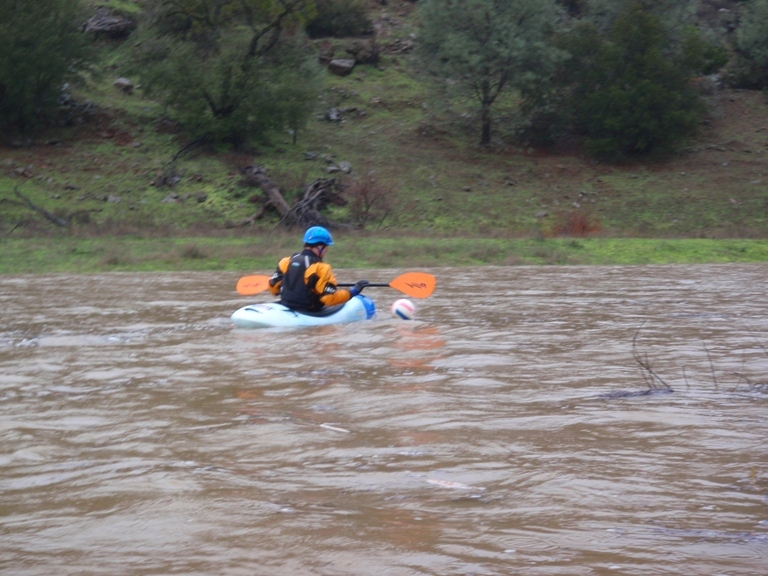 With high water this section took less than 40 minutes to float. If you are lucky you will find beach balls, or volleyballs, or tennis balls, or footballs to play with to help pass the time. At mile 3.5 you will see the gauging station on your right. For reference at our flow the gauge was only 6 inches out of water. Numero Uno (III+ to IV-). At the high water the whole first gorge was one continuous rapid though Dos and Tres stood out as bigger sections of the rapid. Uno was just read and run big water. I vaguely remember a small hole in the center. Whatever it was, both Darin and I had our memories of it washed by the next rapid. Numero Dos (IV+). Huge wave train. The left channel looks frightening as you enter but it turned out the exploding wave was just that, backed by several more waves. I give it a IV+ not for difficulty but instead for consequence of a swim. 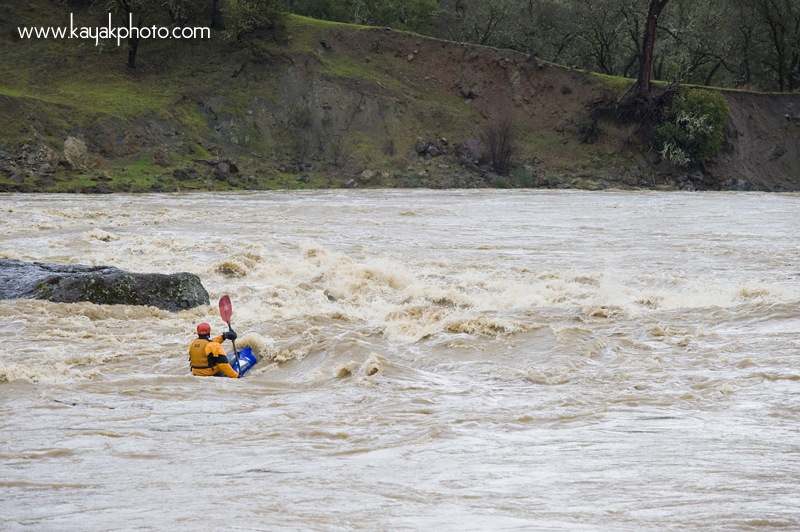 The next rapid is immediately around the corner and whitewater continued straight to it. Several flips is a real possibility in Dos, just keep rolling and know that there are no rocks in the first gorge at high water. Numero Tres (IV to IV+). Another great rapid full of large waves and some small holes. We ran down the right side but in hindsight the meat line is good to go down the center. 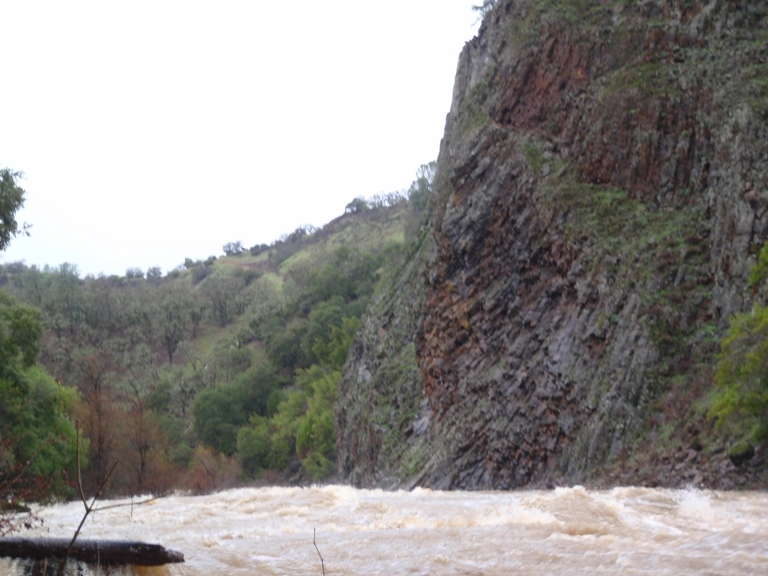 Hunting Creek entered on the left adding 1,500 to 2,000 cfs. This is a sign that more goods are coming. Splits Around a Rock (IV). The right side is a horrible pour over. 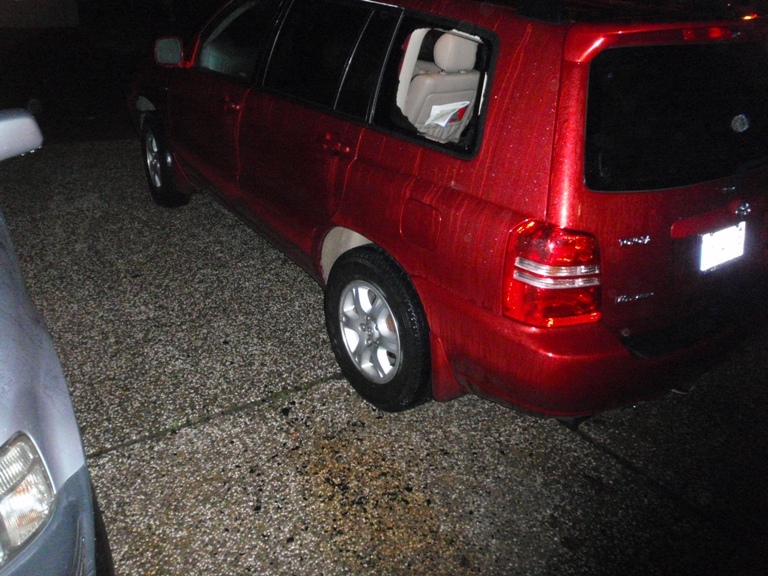 The left side ramped down into several holes that you want to avoid. We avoided them left but I think the right also went. Regardless, the water on either side of the holes were very large boulders. The river then bended right and there was a small sievy rock pile on the left shore. Ramp (III+). The one rapid we actually scouted., go figure. It was a bit steep from above and appeared to drop into a bad hole or pocket against a rock. As it turned out there was a straight forward ramp leading to a huge eddy line on both side. The left had 20 or 30 trees swirling around in it. Up to this point there was always trees in the rapids with us, more debris than I had ever seen in a river, after this point it was markedly cleaner. Small (III-). As we entered what turned out to be the second gorge, things picked up with an easy wave train rapid which then bent around to the left. And led into Numero Cuatro. Numero Cuatro (IV-). A wave train with a sizable lateral on the right that needed to be punched prior to finishing the ramp due to the sizable hole awaiting at the bottom. Easy move though things are about to get hard. Numero Cinco (IV+ to V). We entered right and stayed right. In the middle were house sized holes. On the right bank was an apartment sized pour over. Our line was about 3 feet to the left of pout over, hitting the lateral next to it and trying to typewriter you into the holes in the middle. Once through that lateral you had several very large crashing waves to punch. The river then split around an island. The left had the most water but also was furthest from us. The right was in the willows. So we went down the center which ended up being an easy class III channel. The water then keeps moving up to Numero Seis. Numero Seis (IV+). One of the steeper and briefer rapids of the run. We entered far right heading a little left behind a large rooster tail. 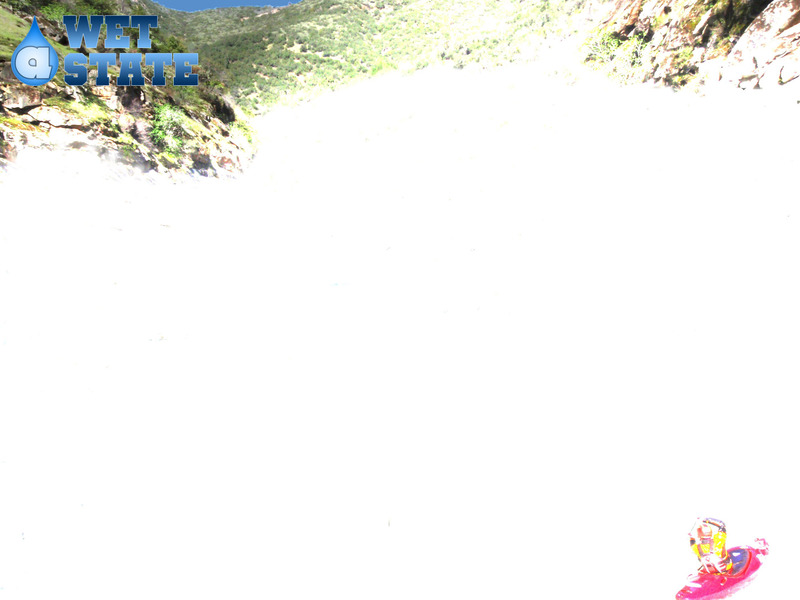 There was a sizeable lateral hole at the bottom of the rapid to punch with left momentum. Be careful to not be too far right as there was a horrible pocket hole depressed 3 to 4 feet and against the wall. You would be very helpless in that hole. Once through the lateral hole keep driving left to avoid getting pushed against the wall, which had a decent reactionary forming a hole against it. The rapids end abruptly and you have one more mile to take-out. Take-out: 100 yards North of Middletown take Butts Canyon Road for about 10 miles. Turn left on Snell Valley Rd. Continue and cross the creek twice. Find somewhere to take out that respects all the private property. A bit hard. 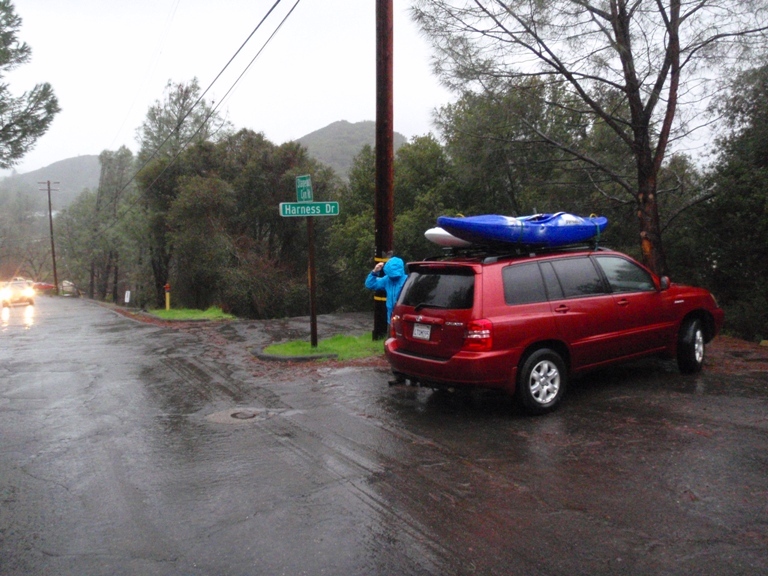 We parked at a small drainage ditch that was running down the hill to the water. Put-in: Head North from Middletown on Highway 29. In 4 miles you will cross Putah Creek. We put in on the North side where there is a nice large turnout and easy access.